Lightly butter an 8x8 baking dish. Then, in the dish, combine the eggs and brown sugar and mix together well with a fork. Stir in the 1/4 cup milk and eggnog and combine. Stir in spices and a pinch of salt. Once everything is combined well, stir in rolled oats. Bake oatmeal at 350°F for 40-45 minutes until the center is set and the edges are lightly browned. Serve oatmeal with warm milk. Eggnog, for me, is the signature sign of the holidays. I don’t know too many people that don’t like a bit of eggnog (maybe mixed with some booze) to get the holidays flowing. It’s rich, creamy, and just hits the spot. What most people don’t know is that besides drinking the stuff, you can also cook with it! I regularly experiment with it by substituting it instead of milk in recipes. In this case, that recipe is one of my favorite breakfast recipes for a cold winter morning: baked oatmeal. The great thing about eggnog baked oatmeal is that all the work is done the night before. All you have to do is wake up, pop it in the oven, make some coffee, and breakfast is served. When it comes to choosing eggnog, I tend to think that most store-bought varieties are interchangeable. If you have a favorite, use it. One thing I always look for, though, is if the eggnog has high fructose corn syrup in it. I tend to stay away from those brands just because they tend to be super-sweet. The other nice thing about this dish is that you prepare it all in the same pan. It takes almost no time to prepare and uses ingredients that you most likely have sitting around during the holidays. Start by lightly buttering an 8x8 baking dish and then adding your eggs and brown sugar to the dish. Mix these together with a fork and then stir in your eggnog and milk. The eggnog has a lot of flavor to it, but it never hurts to add some extra spices. 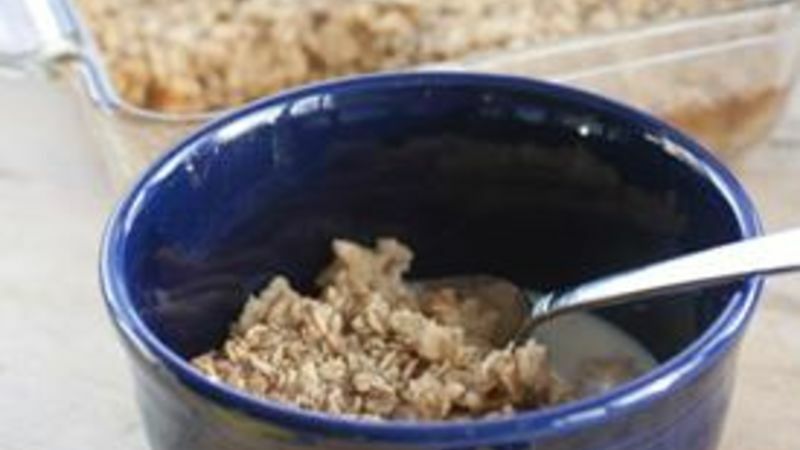 Once you get this base completely mixed together, go ahead and add in all your rolled oats. It might seem like there’s a lot of liquid in the dish, but it will all be absorbed. Trust me. Cover this and let it chill overnight in the fridge. The next morning, you’ll see that the oats have absorbed pretty much all of the liquid. Then just bake this dish at 350 degrees for 40-45 minutes. The edges of the dish should turn light brown. This will make your house smell so amazing. The neighbors will be calling you for the recipe! The finished oatmeal is a dense and delicious thing. I think the recipe is a bit to heavy to eat by itself, so warm up a few cups of milk and serve a big scoop of the oatmeal with some warmed milk poured over it. It’s heaven in a bowl. This recipe is easy to double and great for a crowd. If you double it, just upgrade your pan to a 9x13 size. The finished oatmeal will be a bit thicker and might need an extra 10-15 minutes to bake. Nick believes in drinking at least one gallon of eggnog every December. It’s just the right thing to do. Be sure to follow his blog, Macheesmo, and check out his Tablespoon profile.